On an early September morning, I roust my husband by frying bacon and brewing a pot of tea; that usually gets Hitch up from a deep slumber. I can get pretty excited when we visit a national park I’ve never seen before. I’ve read all the online material and even marked out some places on my map. I feel giddy and want to get an early start. I’ve even prepared snacks and an audio book for our journey. 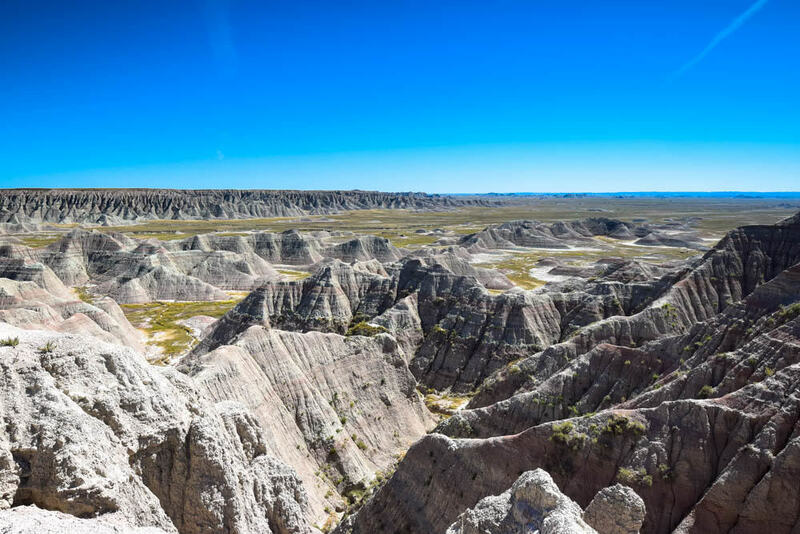 I know that driving to and from Badlands National Park will be a long one since we are work-camping just beyond the South Dakota border in Wyoming. 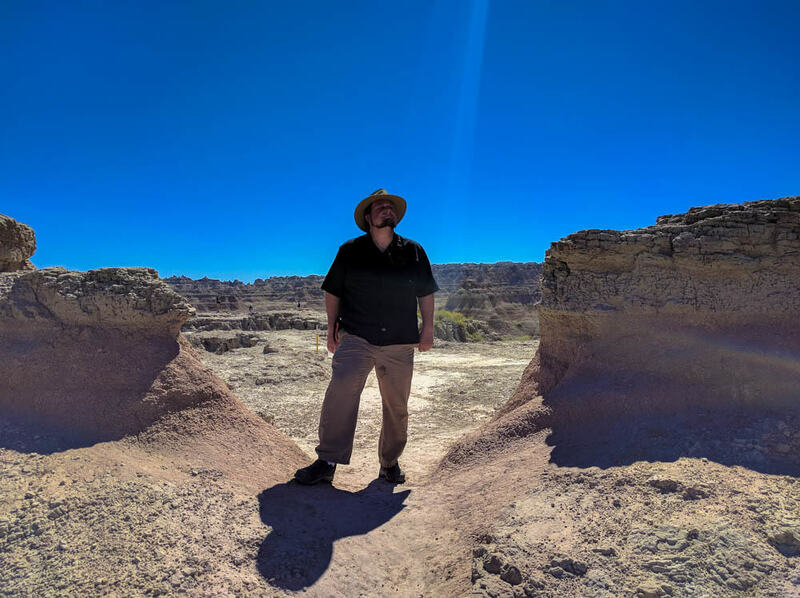 After a two hour drive on I-90 and a short stop at Minuteman Missile National Historic Site, we’ve reached the Northeast Entrance of Badlands National Park. We quickly get through the car line and into the park thanks to our Annual Pass and the fact that we’re going opposite traffic. The gatehouses seem to have a great view of a prairie which the buffalo and other animals favor. A lot of tourists come from in from the Badlands Pinnacles Entrance, since it’s closer to Rapid City. 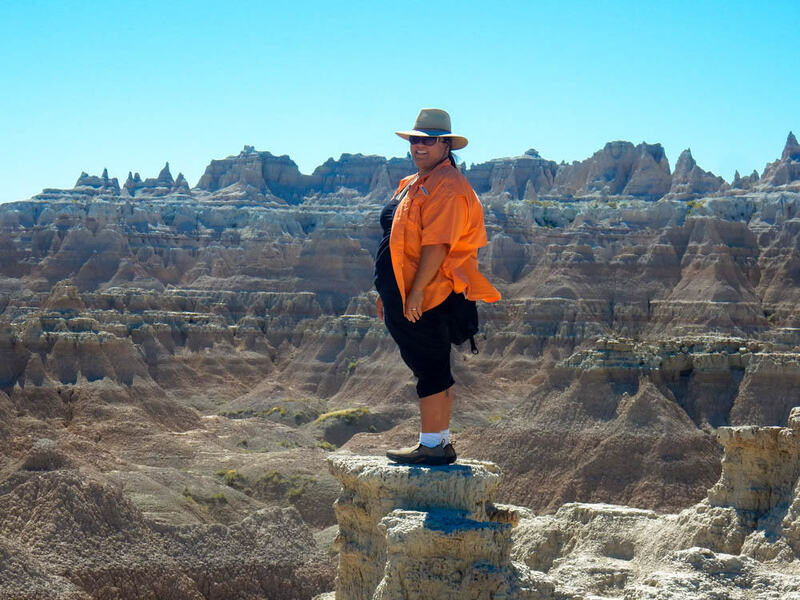 Big Overlook at the Wall – that’s one helluva wall! Just beyond the entrance, we take a left onto a spur road leading to our first scenic pullout. 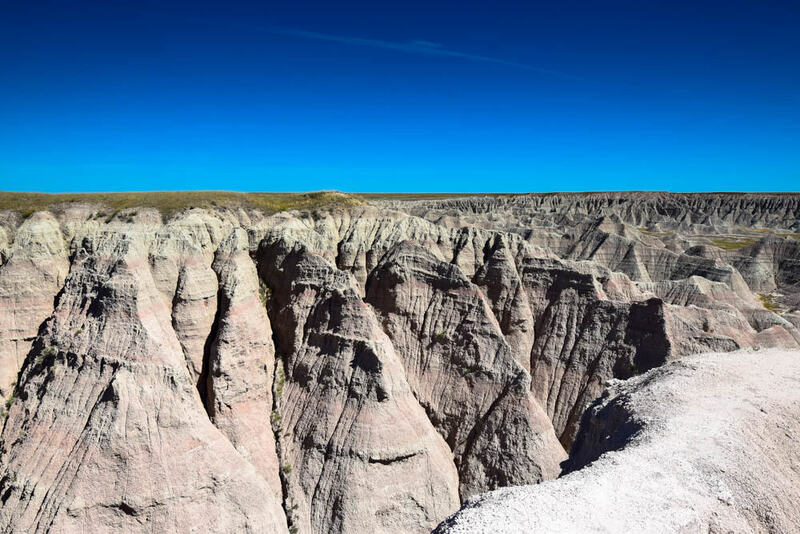 This location offers us a sweeping vista of those famous Badlands formations. I look down at the steep, jagged, and crusty earth and wonder at the amount and force needed to erode miles of this landscape. 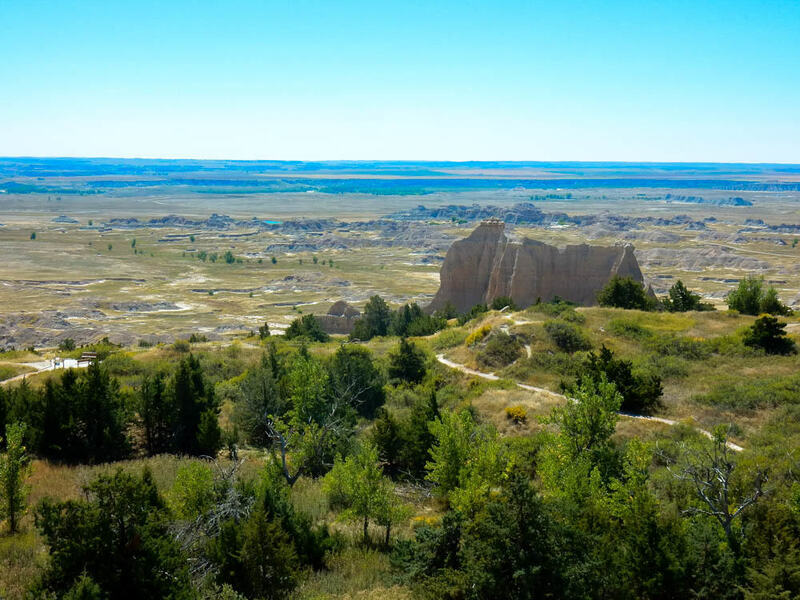 I’m looking at the “The Wall” from above and trace the cliffs down as they drop distinctly into the lower prairie lands. In the distance, I spot the White River as it drifts through the landscape. We stay here for a while and let the view soak in. 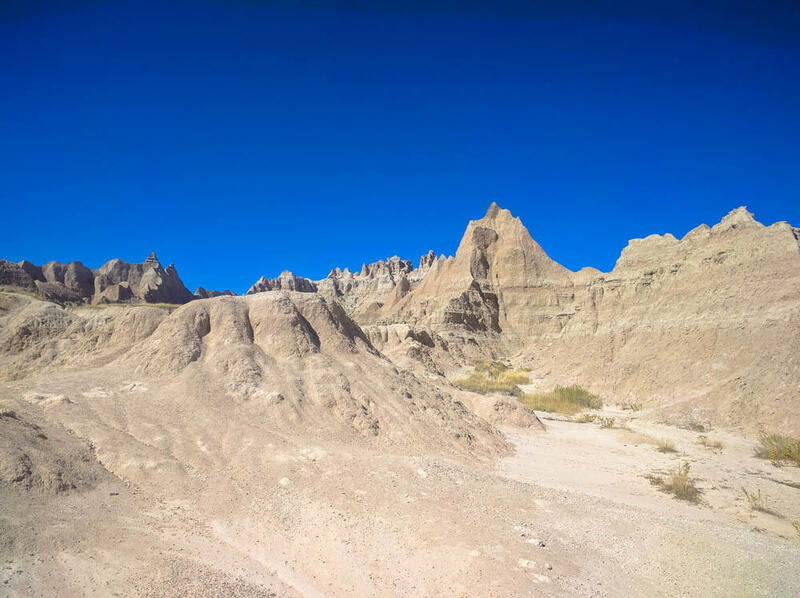 At our next stop, we gain access to three trails that lead to different perspectives of the Badlands Wall. We take Door Trail first and find ourselves in a lunar landscape once we leave the boardwalk and head out into the rough. Trail markers guide us through a tight opening in The Wall and into a hodgepodge of desolate and eroded hills. I feel like an alien in this beautiful landscape. I know I don’t belong here and would suffer without water or shade. The heat beats down mercilessly and I swear I can see Hitch’s skin turn red right before my eyes. Just a short distance from Window, the Notch Trail offers a rougher path and leads up a ladder and alongside a gully to another break in The Wall. Here we can look out into prairie and out to the White River. Back in the truck, we take a short drive to the Cliff Shelf Nature Trail, which introduces us to a small juniper forest nestled along The Wall. The land beneath this microenvironment houses a giant block of stone, creating a flat shelf. The giant stone will take eons to slip from the surrounding cliffs, especially in comparison to the surrounding soils. The active process slowly compresses the stone, making it less permeable and leaving the water to accumulate here. 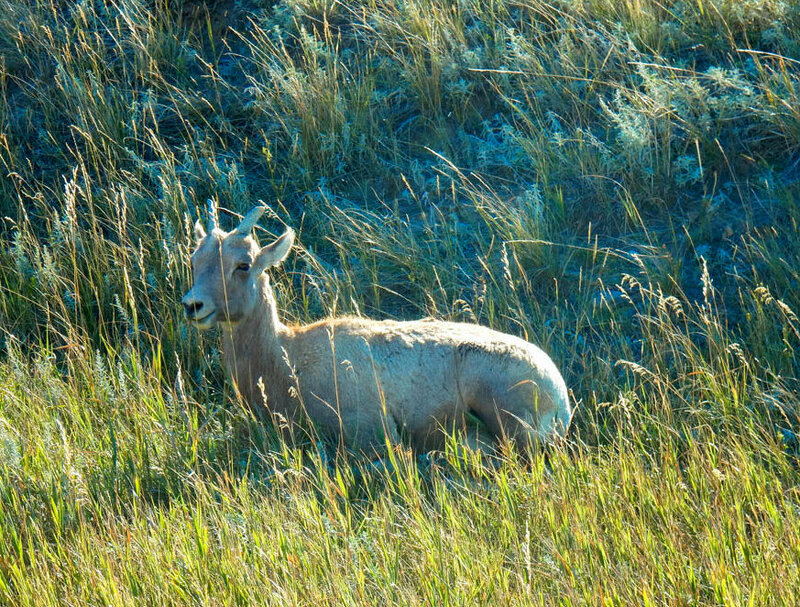 During the spring, a small pond attracts Bighorn Sheep, a deer, and other animals. Since we’ve arrived late in the summer, the pond evaporated months ago. The junipers exude the scent of Christmas and flashy magpies dart in and out of their branches. We make our way to Ben Reifel Visitor Center, where we can get a good initiation to the park’s past and geology. Exhibits display the kinds of life that inhabited the Badlands area millions of years ago. They also have a video which goes into some detail about the park, but we’ve vowed never to watch another park video after falling asleep too many times. A real gem of the visitor center lies tucked away in the back, near the water fountain. Through an unassuming doorway lives the Paleontology Lab. Open only during the summer, we got a last chance view of the latest specimens. Behind desks and plexiglass, paleontologists work with light hand movements and examine fossils through viewing scopes. 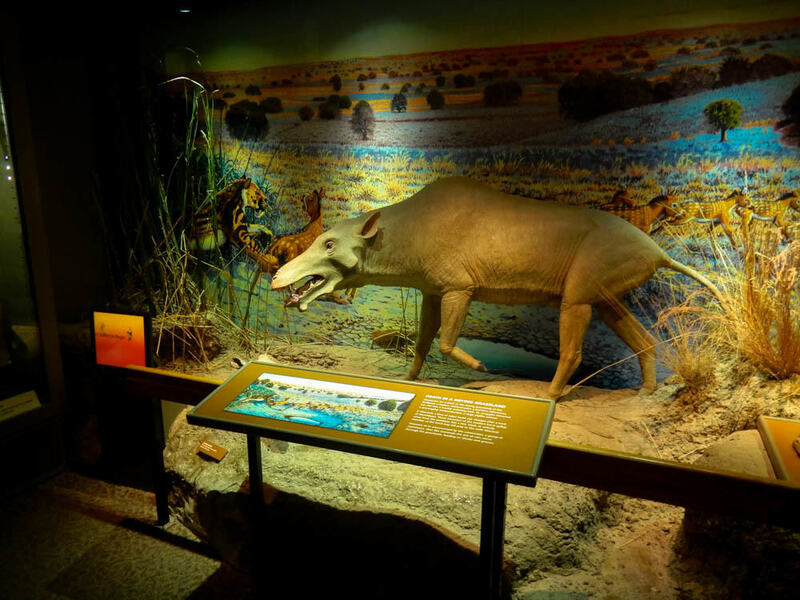 Ben Reifel Visitor Center – Paleontology Lab alone is worth the visit. From the Visitor Center, we truck on to the Fossil Exhibit Trail. 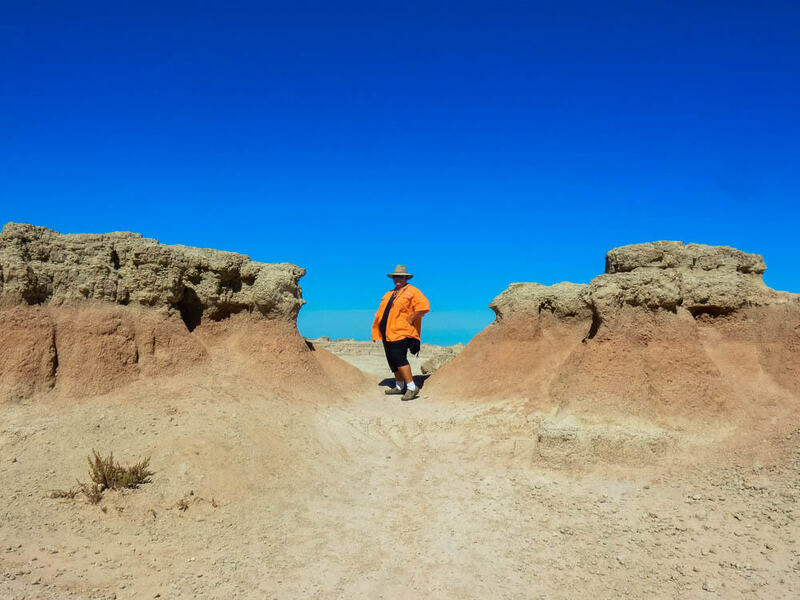 Sadly, there aren’t that many actual fossils along the super easy quarter-mile trail, but instead, a number of kiosks describe the prehistoric inhabitants. The boardwalk looks fairly new and is fun to walk on, but I was disappointed that there were no actual fossils on the ground to view. Regardless, I got pleasure from viewing the landscape and the occasional bird, while learning about the prehistoric animals. About this time, “view fatigue” starts to hit Hitch and he’s trying not to be board. I, on the other hand, can’t get enough of it. 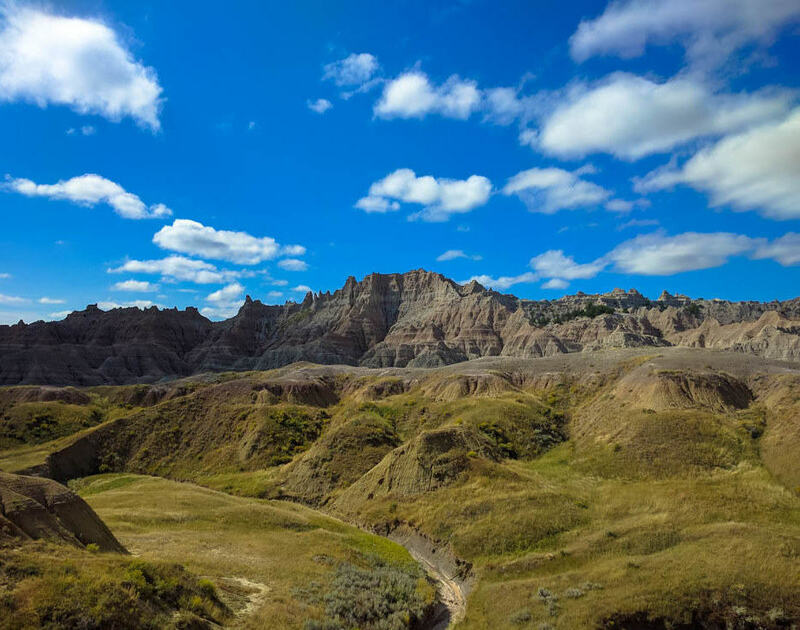 This particular location was named after Chief Big Foot, a Miniconjou Sioux Chief who lead his people across the Badlands as they fled the U.S. 7th Calvery to Wounded Knee. To the north and east, a field golden grass shivers in the wind, and on the west and south, a road carves through The Wall. 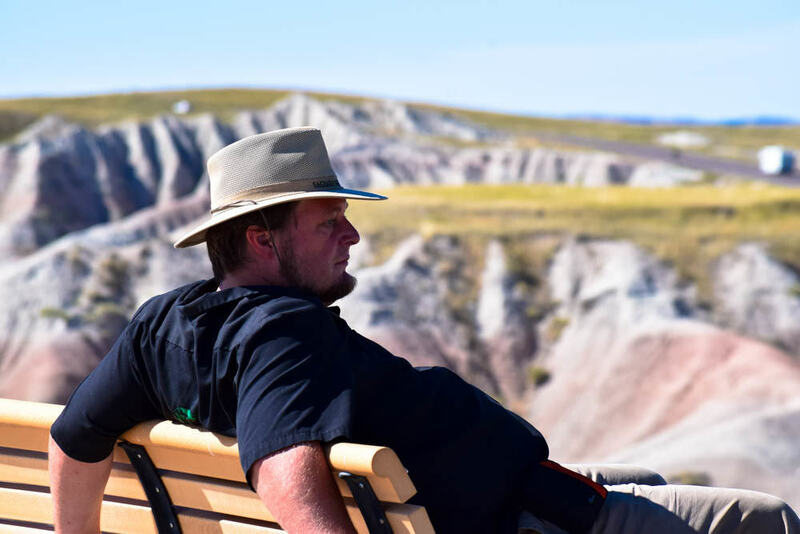 Hitch at Big Foot Pass Look – are you bored yet? At mile 17, we took a short boardwalk through a prairie land and native plants restoration. I suppose it also gives you something else to look at other than The Wall, but on a good day buffalo, bighorn, and pronghorn will roam among the grass. Just before the pave road ends, we decide to take the left fork and onto Sage Creek Rim Road. It’s a dirt road, but it’s been improved and doesn’t require our truck to go into full 4×4 mode. The drive takes you along the north edge of the wilderness area and is exquisitely beautiful. Our little excursion on the dirt road rewarded us with glimpses of bachelor buffalo, bighorn sheep, mule deer, a golden eagle and ferruginous hawks. 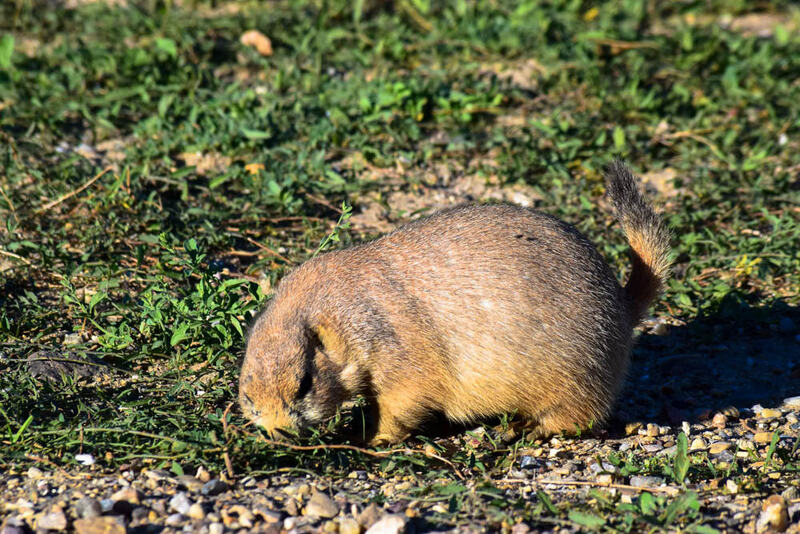 We also stopped for a while to observe the natives of Roberts Prairie Dog Town, who were in a fury to put on pounds before the winter season. Although I was told that burrowing owls also make their homes here, we didn’t spot any from our scouting location. Chubby prairie dog getting a nice winter fat layer. Trail at Door Trail – Having a great time! 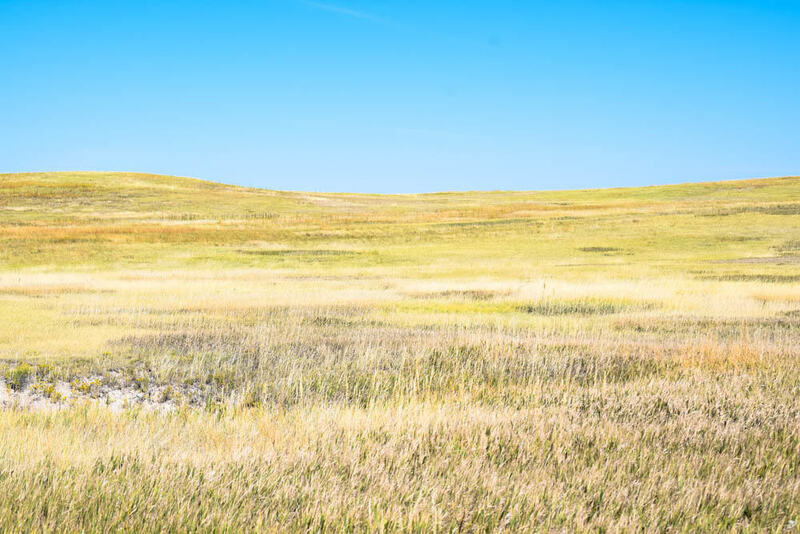 Near the Yellow Mounds – the yellow soil is fossil soil, revealed from another time.